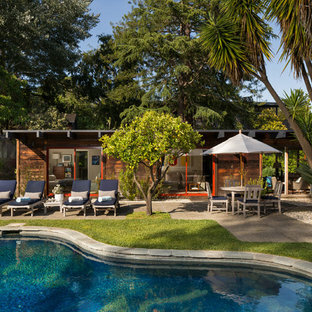 © Kim Smith Photo The organic shape of the in-ground pool pairs perfectly with the landscaping. 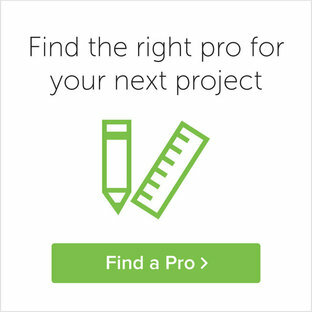 By Cutting Edge Homes Inc.
Magic Landscaping, Inc- New Jersey Landscape Designer & Contractor. The French country influence is clearly evident in the style of the architecture and materials, which includes old world random stone work with wide mortar joints and contrasting dark timber supports and trim. The highlight of the backyard is a massive 19 x 49 dry Gunite infinity pool with visual zero edge. 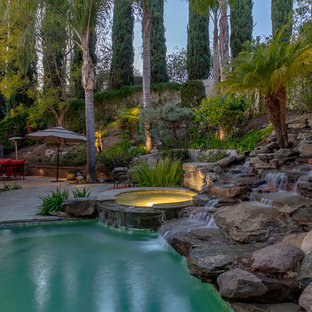 This luxury in ground swimming pool has a granite waterslide, waterfall spillways, and a tiled hot tub. 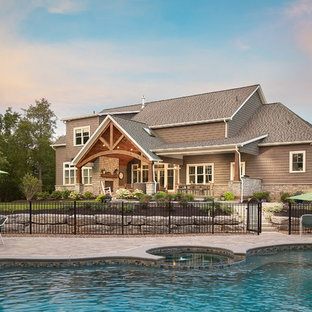 Designed and built by: Alan Kallerman, Owner of Pacific Pool and Spa. 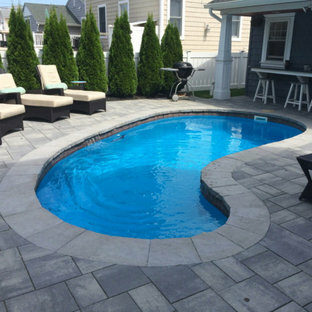 Swan Pools | Aesthetics | Stone - Three Rivers For free estimate, please contact 1-800-FOR-SWAN, or visit http://www.swanpools.com. 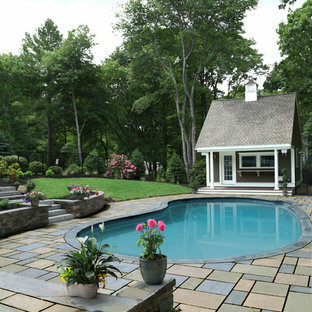 Swan Pools | Begin your backyard dream today! Custom designed and built swimming pool in Tyler, Texas. The Backyard Oasis! Photo by Preferred Pools Inc.